“I don't understand how I can spend over an hour trying to delete music off my iPhone 6 iOS 8, and still not be successful. I've googled 4 or 5 different ways to delete iTunes music that's downloaded to my iPhone, none of which worked” says a Redditor. Many iTunes Users encounter difficulties when deleting songs from iPhone using iTunes, but many just accept it as one of the drawbacks of using an iOS device and just move on. It isn’t supposed to be so; there are reasons why you can’t delete songs and there are solutions to such issues too. On the reasons why you can’t delete iPhone songs on iTunes, here are some of the possible reasons. Step 1: Go to iTunes summary page and check the box next to “Sync Only Checked Songs and Videos”. Step 2: Now, you can go back to music tab and select “Sync Music” and “Entire Music Library”. Step 3: To ensure that you’ve selected the music that you want to sync, go to main music list on iTunes and check off songs you want to sync. Step 4: Sync your iPhone. 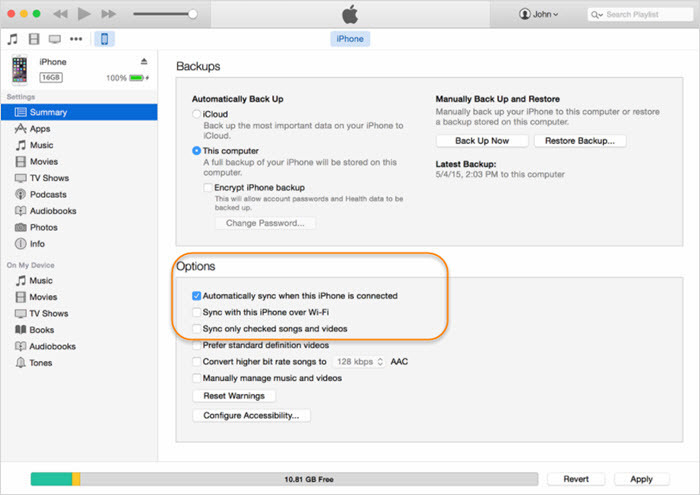 This would help to avoid interference while deleting iPhone songs with syncing iTunes. I got to understand that when you use your iPhone to purchase songs directly from Apple Store, you cannot delete such songs using iTunes. This also applies to when you sync a song from iTunes, and you want to delete them from iPhone, that won’t work either. To manage issues like this, check to know if the song iTunes is refusing to delete is directly purchased from Apple stores, if yes, then delete it directly from your iPhone. More so, if you are finding it hard to delete a song from your iPhone manually, then check to see if you can use iTunes to delete it. There are quite a good number of ways to delete songs on iPhone with no help from iTunes if iTunes won’t let you delete songs. These methods are available with iTunes alternative tools like iMyFone TunesMate. iMyFone TunesMate is a third-party application that allows you the full control over your iPhone files and music library with zero restriction. It has the capacity to delete any type of song on iPhone even when iTunes has failed to delete such songs. The following simple steps can aid you in erasing songs that iTunes won’t let you delete on iPhones using iMyFone TunesMate. Step 1: Download and install TunesMate on your Mac or PC. Then, connect your iPhone to your computer and launch the Tunesmate application. Step 2: Click on the music tab, and your iPhone music library will be displayed. Step 3: Select the songs you’d like to delete, and click on “Delete”. Step 4: A notification will pop-up asking whether you want to delete the selected songs, click “Yes” to complete the process. Preview and selectively delete songs/music/videos/photos/files from iPhone in bulk. Two-way sync to transfer files from iPhone to computer/iTunes, or vice versa. Transfer music/videos to iPhone without any damage to media library on iPhone. Transfer songs that you purchased from iTunes or downloaded from the Internet for free without losing them. Transfer songs that you purchased from stores other than iTunes, such as Amazon or Google Music.